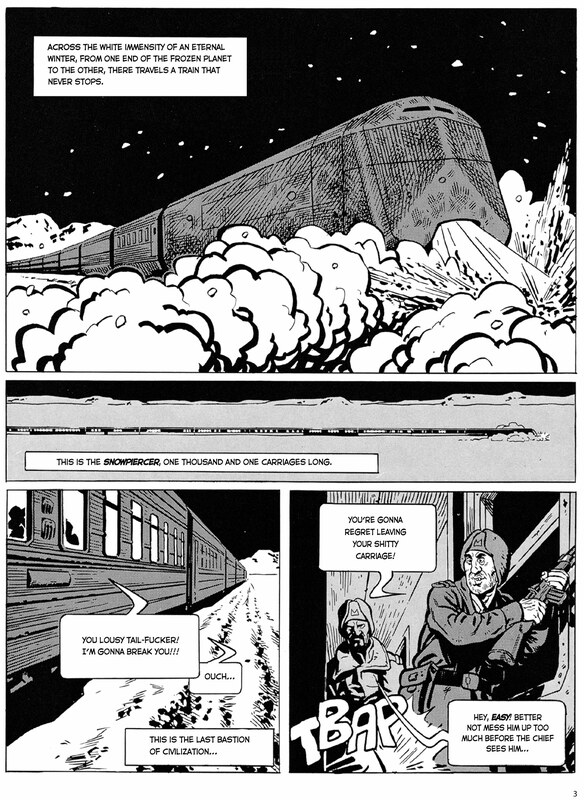 Snowpiercer is a graphic novel that is just coming to prominence in the West. It has recently been translated and published in English for the first time by Titan Comics, in anticipation of Bong Joon-ho’s 2013 film version that will hit the States at some point in 2014. The film is Bong’s English-language debut, as approximately 80% of the film was shot in English, with notable American stars — Chris Evans, Tilda Swinton, Ed Harris, etc. — filling out many of the roles. So with that in mind I dove head-first into the unique and desolate vision of the future that Snowpiercer provides. The title refers to the unique setting of the comic, a 1001-car train which never stops. At some indiscriminate point in the book’s past, there was a cataclysm that caused the Earth’s climate to be completely and irrecoverably damaged, sending our world into a neverending, harsh winter too cold for humans to survive. What remains of human civilization is aboard the Snowpiercer, but even in these dire times social classes and economic inequality segment the population. Those in the tail cars are cramped together and left without food to eat or even windows to provide light; they are prisoners of a rolling ghetto (to use one of the book’s terms). Meanwhile, those in the cars closer to the engine live in luxury. Simply depicting such strife isn’t enough to constitute a story, though, so the book opens with one of the tail-fuckers (as the guards call them) sneaking his way into one of the military cars and breaking a window to allow the cold in. The guards apprehend him for questioning, but the man — Proloff — refuses to speak much. While he is detained, Adeline, a humanitarian activist who hopes to better the plight of the people in the tail, talks with the lieutenant who has detained Proloff. He refuses to tell her anything, but she won’t be denied so she sneaks into Proloff’s cell… only to then be detained right alongside him. What follows is a fast-paced, easy-to-read tale that doesn’t disappoint. A lot of the book’s success is tied to its wonderful premise and setting, but the story is always interesting as well. The characters could be a little more defined, but their mysterious nature (especially the main character) is also what makes the book so riveting. I turned the pages quickly, hoping for answers. I’ll admit to being confused numerous times throughout because of quick jumps between settings and a general sameness to a lot of the character’s looks (especially the military guards and the like), but this confusion never hampers the book’s dystopian intrigue or its serious, somber tone. The art is exceptional and captures the mood of the tale perfectly. The black & white palette makes the book more cinematic and engaging than it would have been with color. It also depicts the stark reality of this barren, apocalyptic future. There’s no more time for nuances, the color of life has drained out long ago for these characters. All that remains for them is their inevitable death on the train or the “white death” of the snow outside. They are humans living entirely in survival mode. 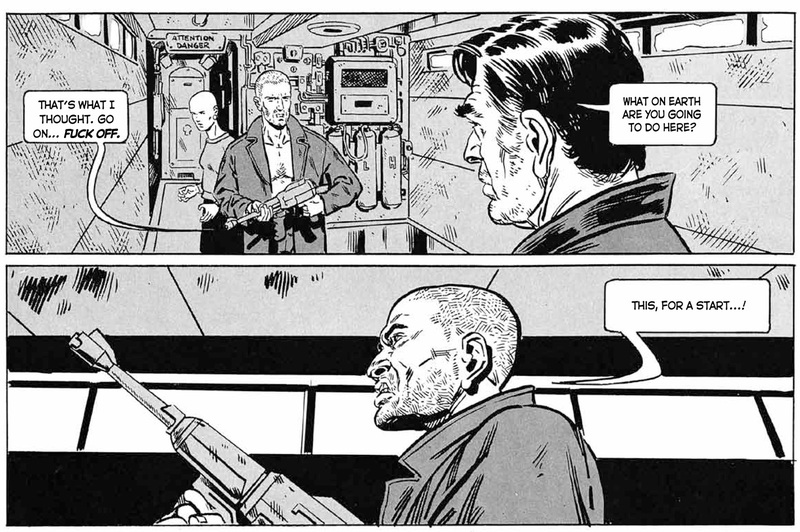 Snowpiercer might not be as relevant now as it was in the ’80s, when Cold War tensions ran high and the threat of Nuclear War was ever-present, but it remains a stunning book that is unlike any comic I’ve read previously. The economic inequality depicted here will definitely still resonate with many Americans, though. The book doesn’t flow quite as well as I would’ve liked, but as a whole it’s a triumph of the medium. Definitely worth checking out for anyone interested in comic books, or that might be looking forward to the film. And judging off this first volume, Snowpiercer could make for quite the unique, thought-provoking, thrilling film. The English edition from Titan Comics — released January 28, 2014 — is quite nice, a large hardbound edition that allows ample room for each panel to shine. Titan has also sent me Vol. 2 of the series, so check out that review too! Disclosure: Titan Comics provided me with a review copy of Snowpiercer Vol. 1: The Escape.